Boots Tails fund-raiser for Educated Canines Assisting with Disabilities (ECAD), which raised approximately $100,000, at a private estate in town. 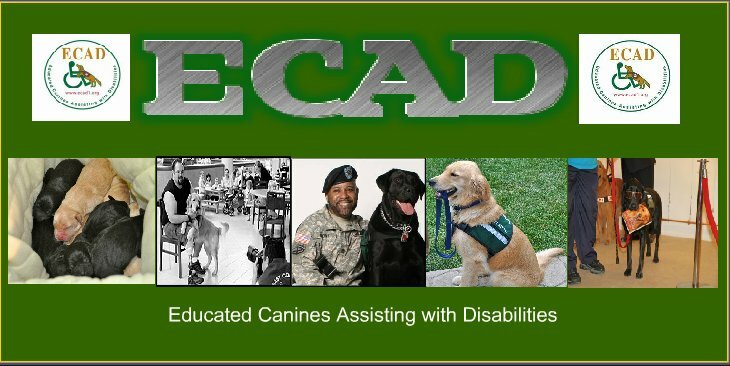 At the completion of their two-year training, ECAD’s service dogs are able to perform more than 80 commands, performing tasks such as opening doors, pulling wheelchairs and retrieving items for people with any number of disabilities including autism, heart conditions and Post Traumatic Stress Disorder (PTSD). Such specialized training costs approximately $25,000 per dog, prompting Saturday’s fund-raiser for the nonprofit organization, which was established by Dale and Lu Picard in 1995 to educate and place service dogs with disabled people. Doing this allows for the people to have greater independence and mobility and, according to Mr. Picard, ECAD, was created by accident, thanks to his wife, Lu. After her father suffered a stroke, Ms. Picard trained her dog to help him get to his feet and assist with his balance. When she realized the transformation the dog had made in her father’s quality of life, Ms. Picard traveled to California for a six-week dog training course and shortly afterward established ECAD with her husband. The couple knew their organization was successful when Mr. Picard said the doctor of one of their first clients related that the client’s service dog had saved his life at least half a dozen times. The dog was able to pick up on the changes in his master’s body language and posture that indicated heart failure, then cued others to the danger, he explained. The couple’s work soon caught the attention of Sam Ross, who wanted to add a dog training program to Green Chimneys, his animal-assisted therapy school in New York. After meeting the Picards, Dr. Ross immediately provided them with a contract, feeling that service dogs could significantly help challenged youth, like his students. “Today we have 225 dogs out there working with disabled people, all trained by kids” from alternative schools similar to Green Chimneys, Mr. Picard said. At-risk children and teens with a variety of emotional problems now provide the two-year training of ECAD’s service dogs at six alternative schools throughout Connecticut and lower New York. Given that the youth trainers, the client and the dog each benefit from the “ECADemy” program, “It’s a positive win for everyone,” Mr. Picard said. The youth are given a sense of control and accomplishment, the client is provided with greater independence, and the dog has both a purpose and a companion. As ECAD has evolved and grown over the years, some of its most common clients have become injured veterans, which prompted the establishment of the “Project HEAL” program in 2008. The program was designed specifically for wounded warriors, pairing veterans with specially trained service dogs who assist them with both visible and invisible disabilities. 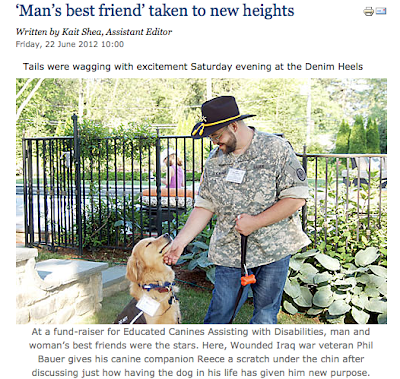 Phil Bauer, a Project HEAL beneficiary-turned-volunteer, attested to the success of ECAD’s programs Saturday night, accompanied by his service dog, Reece. In 2003 while serving in Iraq, Mr. Bauer’s helicopter was shot down near Fallujah. After surviving a 200-foot drop, his legs were trapped under the fallen helicopter, eventually resulting in the amputation of his right leg below the knee. After suffering from both his physical injuries and PTSD for several years, Mr. Bauer said he eventually found ECAD and immediately “fell in love” with their ideology. Today, two-and-a-half years after being paired up with Reece, Mr. Bauer said his life has completely changed. Former Eastchester, N.Y., police officer Lee O’Brien-Rothmann, who now assists ECAD with its social media, has had a similar life-altering experience. After an incident in the line of duty caused Ms. O’Brien-Rothmann to suffer extreme PTSD, she began to research service dogs and discovered ECAD. “I didn’t leave the house for two years. Once I came into ECAD, it was like my whole world was open again,” she said. The organization’s positive energy had an immediate effect, as did her service dog, Brady, she added. Avril Dennis, a licensed clinical social worker who has partnered with ECAD for nearly 13 years, said she has “hundreds and hundreds” of success stories relating to the organization. Ms. Dennis began her relationship with ECAD after taking a position at The Children’s Village, one of the alternative schools whose youth help train ECAD service dogs. When the dogs were introduced to group therapy sessions at the school, student attendance increased, Ms. Dennis said. “Meaningful dialogue went up,” along with the quality of relationships between adults and youth. Currently, said Ms. Dennis, there is a five-dog, 16-person animal assistant therapy team at The Children’s Village residential campus in Dobbs Ferry, N.Y. Working with service dogs has generated breakthroughs for many students, she said. “I’ve had kids who won’t talk to me unless the dog is in the room,” Ms. Dennis said, adding that the dog is a barrier that makes children feel safe, which is crucial at an institution where the majority of students have been through trauma and displacement, she explained. Ms. Dennis, who suffers from an autoimmune disorder and has a service dog of her own, Blondie, said ECAD’s success rate is a result of the organization’s fierce commitment to their cause. Awareness and education regarding service dogs has increased significantly over the past few years and “ECAD has played a huge role” in that expansion, she said. Carrie Picard, the daughter of ECAD’s founders, and the organization’s marketing and social networking managers said ECAD has grown considerably since its establishment and will need to evolve even further. With an increasing need for service dogs, the organization needs to “step up [their] game” in order to fulfill those needs, she said. The challenge will be obtaining more space, more dogs and more funding. For those who want to help ECAD, visit ecad1.org for more information.